I was lucky enough to be invited by my friend David, for a days Salmon fishing on the river Frome near Woole. I have fished this stretch with David in the past, with mixed results. I have never managed to catch a Salmon there, but I have caught just about everything else including Pike and a 20lb Carp. The day started of quite interestingly, as David was attacked by a Hen Pheasant as we got to the river bank. I have never seen such an aggressive display from a Pheasant. I guess she must have had chicks nearby. As we got to the bridge David spotted a huge Lamprey swimming upstream. It was at least a metre in length and must have weighed easily 6lb. We also spotted numerous Thin Lipped Mullet, that were a long way from brackish water. On my first cast with a Mepp one of the Mullet followed my lure. As I was after Salmon and Sea Trout, I didn’t want to spend too much time going after them. The fishing was pretty productive, in that it produced plenty of hook ups with Sea and Brown Trout, but as is so often the case, they managed such spectacular aerobatics, that they were able to shed the hook most of the time. 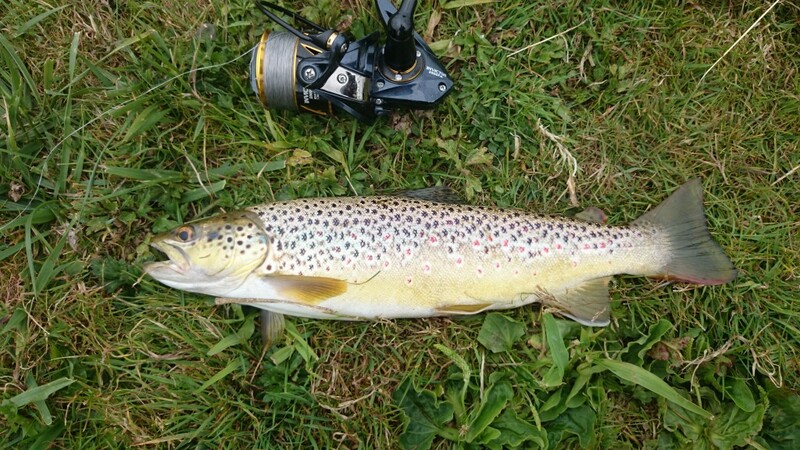 However not everyone did, as this lovely marked Brown Trout managed to make it to the net. I was pretty happy with that, and even more pleased when on the next cast I hooked into something with a bit more weight behind it. The fish headed upstream, taking line from my reel. It didn’t take me long to get it under control and heading back towards me. 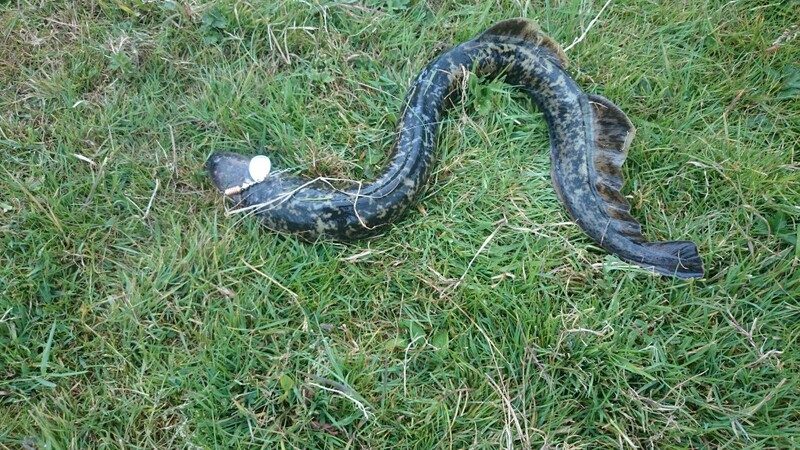 It was at this stage that I thought I may have hooked an eel, then as it got closer I found to my horror that it was a Lamprey. I shouted David to come over as I landed it. To say that neither of us were eager to handle it was an understatement. Even more so when I was taking a picture of it, and it rolled over to reveal the most terrifying set of razor sharp teeth you could imagine. 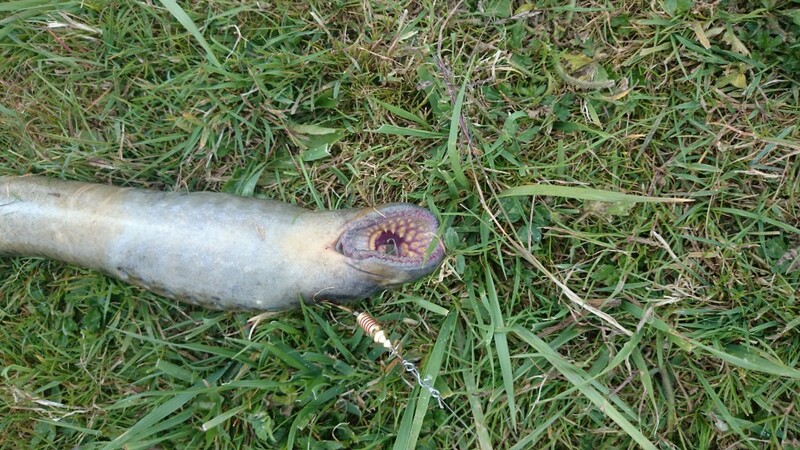 I don’t like eel’s, as my friends that go boat fishing with me know, I am scared of Conger Eel’s, but this thing will give me nightmares. I ended up catching another Lamprey shortly after, so I decided to move to another stretch of the river to get away from them. I hooked and lost another couple of Sea Trout, as did David. After lunch I decided to target the numerous Mullet that were feeding in the shallow fast water. They showed soe interest in the Mepp, with a few following it for a short time before turning away. When I rummaged through my lure bag, I managed to find a small piece of Power Isome worm. This generated a lot more interest, untul they came to mouth the worm. As I have seen so often in the past, they don’t like the taste of Isome, and turn away as soon as they have nibbled it. I am back to fishing the beach today. I am hoping that as the tides start to pick up towards the spring tide on Thursday the fishing will also improve. From the reports I have heard of yesterday and this morning, Chesil didn’t fish that well over the weekend. Plenty of Gurnard and a few Bream showed up, but the Mackerel are still a bit scarce. Chesil Beach forecast: Fishing should pick up this week, as the next set of spring tides approach and hopefully bring a new wave of fish to the shores. As I mentioned earlier the Mackerel are a bit scarce, but heading out after 6pm will normally produce better results. I expect the Bream to start showing in numbers, and the larger ones should be with the shoals. If you are lucky enough to be able to get some Peeler Crab, then a Smoothound could be on the cards, especially if the weather stays settled. Portland: This is one area that did fish well over the weekend, with plenty of Wrasse and Pollock. Unsurprisingly I didn’t hear of any Bass being caught. but I did hear of a large Conger coming from the Crane near the Bill. I have noticed a lot of lure anglers using the Fiiish Black Minnow recently, and a lot of them complaining that they have not had much success. When I asked most of them what other lures they were using, the reply was the same. “None”. The Black Minnow is not the be all and end all of lures. It has gained a reputation for catching fish, but when more than half the lure anglers out there are using it at once, it will catch more fish than they others, just by the laws of averages. You have to think about changing styles and colours when you are lure fishing, as they fish switch on and off at different times of the day, and feed on what is common. At the moment we have a lot of small Sandeel around. So use a lure that mimics one. The Savage Gear Sandeel and the Fiiish Crazy Sandeel are both good choices at the moment. Portland Harbour: I expect to see Bass in the harbour towards the middle part of the week. I noticed more signs of Garfish at Ferrybridge and Castletown, near the sewer pipe. Fishing Tails > All Articles > Reports > Chesil Beach > My scariest catch! 5 Responses to "My scariest catch!" 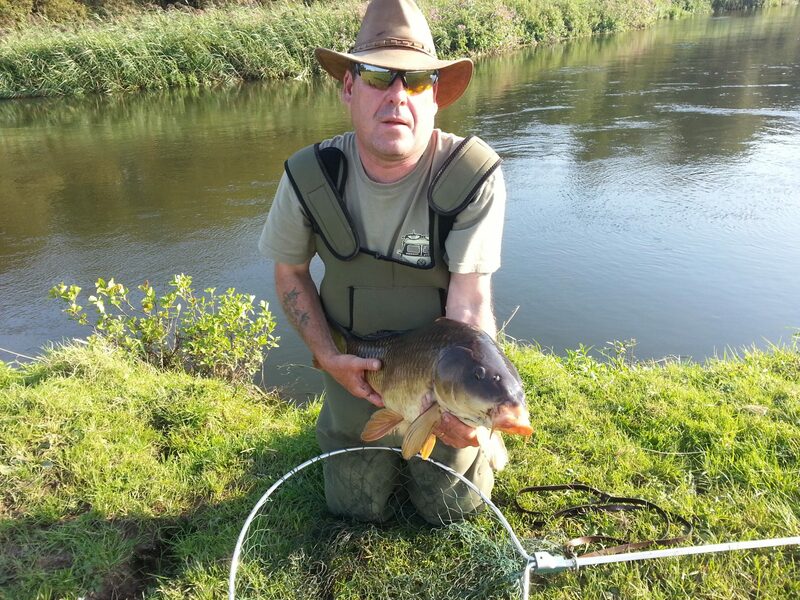 Hi Sean, I`ll try and keep this brief, I was heavily into beach fishing nearly 20 years ago, time and two girls curtailed my sport. however, my youngest daughter`s boyfriend is beach fishing mad! so I`m passing on my little knowledge to him and we are having a great time! I use a Zziplex 1005 and I found another 1005 in the back of the garage which I had forgotten about, so I`ve rung it fixed spool for him. Could you please recommend a fixed spool reel for him, I`ve looked at Shimano beastmaster 7000, Penn surfblaster 7000. I need something which will complement such a beautifully blank. I follow your blog every few days and love it, your doing a great job with it. Both reels you suggested are good reels. As I am sure as a regular reader you will be aware that I have a number of rods and reels currently under test review. For me a test review means using the tackle under my normal working conditions, which is basically abusing it, as I never wash them unless it rains on them, and they get hammered almost everyday in the harshest conditions. A couple of fixed spools that I really like at the moment are the Trabucco Xenos LDX 10000 and the Trabucco Lancer Surf. I particularly like the Lancer because of its 1/2 turn drag system, which is fantastic on beaches like CHesil where you often have to back the drag of instantly with a big fish in the surf. I’ve not managed to catch a Lamprey and hope i never do now after seeing them teeth!